How is a tradition made? I’m inclined to think the plain response is repetition. But look for the underlying root cause and you’ll find desire–that holds something of intrinsic interest. 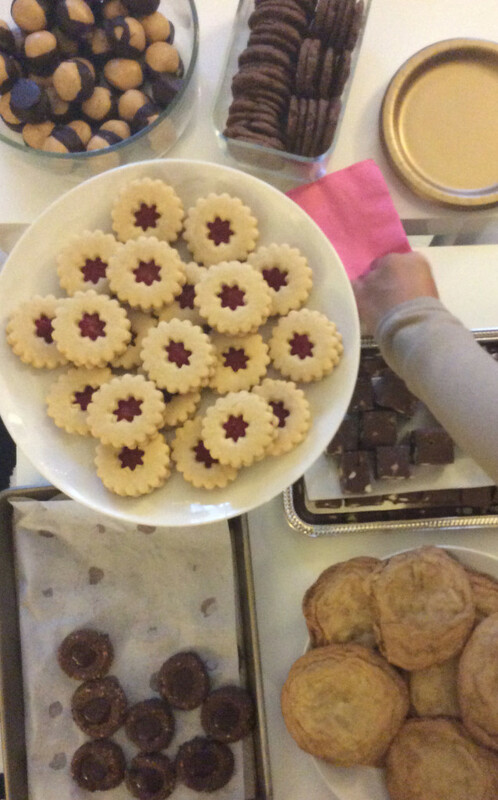 Is it desire for gobbling sugar-laden rounds, crispy or chewy at a yearly cookie swap? Perhaps. But, peek beneath that layer of parchment paper and the desire goes well beyond unsalted butter creamed into brown sugar and granulated white. If we cook to nourish, we bake to share. Growing up, Christmas cookies didn’t factor into our holiday experience. My mom regularly kept keen tabs on the sugar supply entering our house. Once, while visiting family in Mexico, my eyes bugged out of my head seeing the elaborate platters of cookies baked simply for service when guests visited. Can you imagine keeping a cookie inventory with the expectation of people regularly visiting? 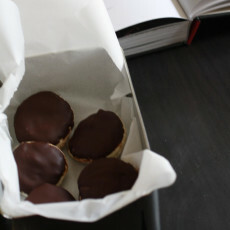 More often, cookies around here get frozen, packed up and toted to work or washed down with a sip of tea. But, once a year, for the past few, we congregate to share cookies with friends who have brought their own batch to dispatch to a new home. This year, I contemplated making this year’s get-together the final hurrah in a string of past year cookie parties. I thought I had baked my last Christmas cookie until the day of the party when I pulled down the new cookbooks I had been waiting to put to good use and which I’m going to highlight below. What I had failed to see as I considered cutting the cookie swap ties is what I actually love about cookie parties. Each person brings cookies that reflect their personality, whether they’re nuanced and complex, simple and straightforward, or adventurous. This year’s batch was no less interesting. Pierre Herme chocolate sables sidled up to chocolate peanut butter buckeyes. Linzer cookies with cranberry orange jam sat near Mexican pfeffernusse. Saffron snickerdoodles and sandwich cookies cut in animal shapes slicked with tomato jam set up shop near double chocolate chip cookies. Chocolate fudge punctuated by white chocolate chips kept company with chocolate hazelnut thumbprint cookies with hot fudge. The array of cookies distributed on the platters reflected the interesting assemblage of characters in our house. Each person’s individuality positively impacted the party and the wild collection of cookies served as a visual depiction. When my friend Kate’s newest cookbook came out in April, I pre-ordered it even though I knew I wouldn’t use it until December. I’ve visited Mindy’s HotChocolate in Chicago and toted home a bag of one of her hot chocolate blends to keep the sweetness going strong. What I liked right off the mark with Cookie Love is how cookie plates play a regular role at HotChocolate. 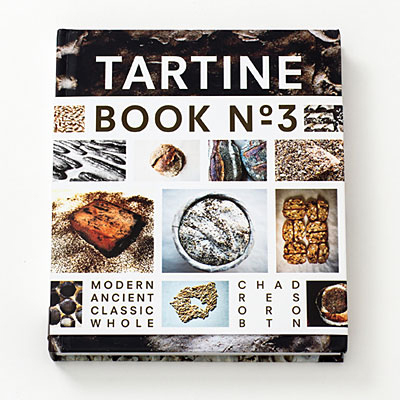 The book is organized like a cookie plate–even the table of contents resembles a tic-tac-toe grid of cookie types. 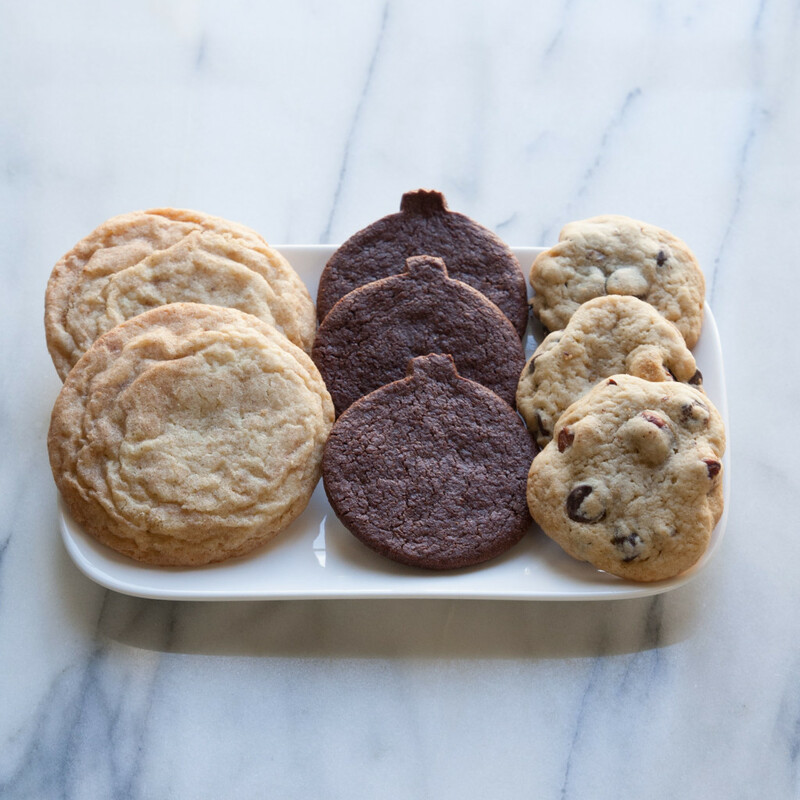 Segal says, “Like serving a cookie plate, making cookies is a generous act.” (p. 4) Her cookie plates focus on providing cookies of different textures, flavors, and colors, offering a cookie type for each kind of eater. Two methods for shortbread yield fun and aesthetically pleasing sandy crisps of Leopard Print Vanilla Bean and Chocolate Shortbread with Hot Fudge (p. 61). Best Friends cookies (p. 119) marry coffee and malted milk hot fudge. In her tough love front matter section, Segal implores you to “Embrace the extras.” (p.4) She puts her methods where her mouth is giving multiple ways that extras can be used up. The photography is inventive and sometimes whimsical much like the cookie-maker herself, evidenced in cookies like the Black Sabbath (p. 85), a deep dark chocolate sandwich cookie with frosty peppermint filling and that pays homage to Segal’s appreciation for heavy metal. Next up on the cookie-baking front: quite possibly the Peanut Butter Thumbprints with Strawberry Lambic Jam (p. 145). But, for the Cookie Swap, I made the Snickerdoodles. 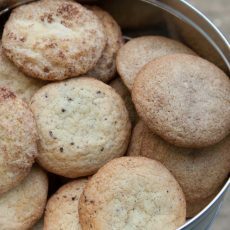 Rolled in cinnamon sugar, the flavor is all familiar but the cookie clincher can be easily summed up as two kinds of salt–one to round out the sweetness and the other, a bit of crunch. 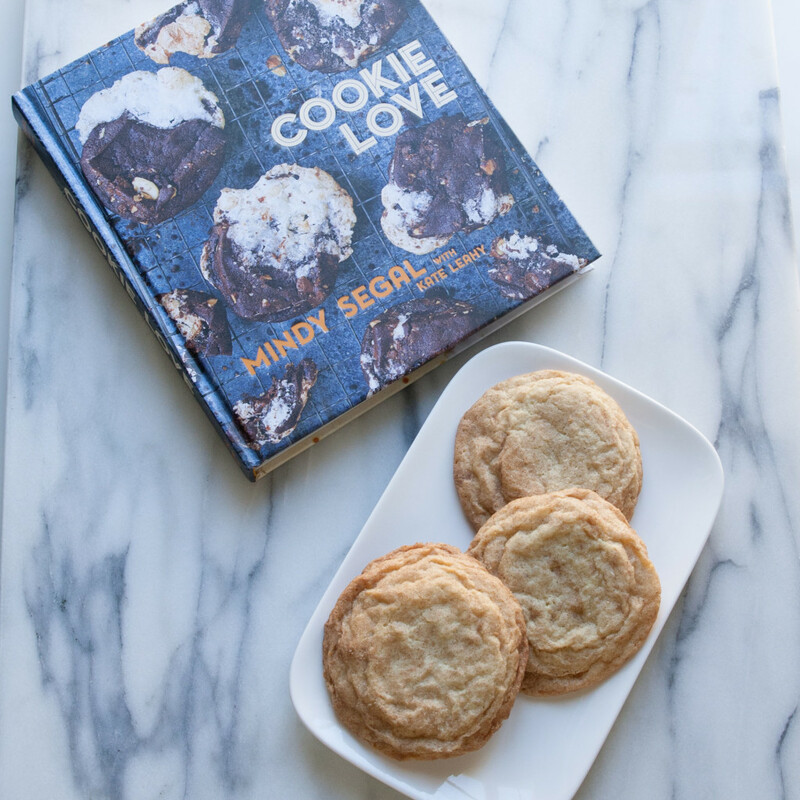 It just so happened that Kate brought Chocolate Hazelnut Thumbprints dented with gooey hot fudge, a variation of Hot Fudge Thumbprints (p. 147) that another party-goer exulted over when the second layer of cookies made an appearance. I met Jeanne in person only this year during a brief trip to Seattle. She kindly let me prep for a cooking demo in her kitchen and after every last ingredient had been measured and bagged, we sat down for tea and she offered me cookies from a batch she was testing. That cookie! Chewy in the middle, crisp around the edges and deeply doused in chocolate, it left quite an impression. When she offered to pack up the batch for me to ferry away to my hotel room, I happily accepted them. Every year at the Cookie Party, I bake a batch of gluten-free cookies. I knew that this year’s fete needed to include one of her cookies and she happily sent me a copy of her cookbook to check out and cook through. 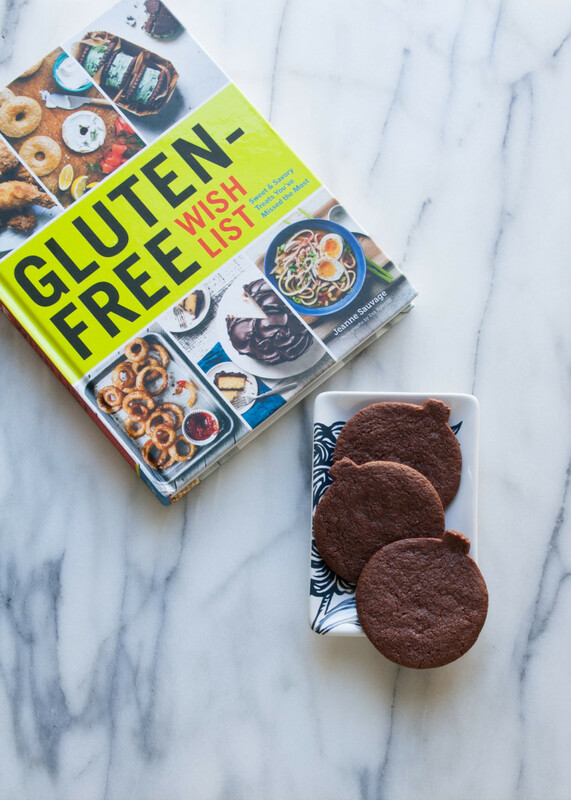 I love the premise behind Gluten-Free Wishlist creating a collection of recipes that include foods that have been missed when living gluten-free. As testament to that idea, one Cookie Party attendee decided to purchase a copy of the cookbook for his sister upon seeing the photo of Ramen Soup (p. 186) on the cover. Sauvage’s foundation in technique comes through in her precise instruction, including a six-page method for making Croissants (p. 147) with a variation for Chocolate Croissants. Using Jeanne’s Gluten-Free All-Purpose Flour (p. 39), a blend that kicks off the book means the recipes that follow it are straightforward with expert guidance of what to look for as you bake and cook. The morning of the Cookie Party, I was running a bit behind schedule and I say this primarily to highlight how easy the Chocolate Wafer Cookies (p. 196) were to make. If I’d had enough time, I would have converted those Chocolate Wafer Cookies into Jeanneos (p. 205), slathering their middles with frosting. And the same cookies would make a fabulous base crust for an icebox pie (hello, Peanut Butter Cream or Banana Cream Pie!). I’m eyeing the Soft Pretzels (p. 69) next and am intrigued by the Gluten-Free Master Sourdough (p. 87) though the recipe for Stroopwafels (p. 206) hits all the high notes for Dutch food taste memories of morsels my Dad would bring home from Henk’s Black Forest Bakery. Over in Emeryville, there’s a tiny bakery that sells a screamingly good hazelnut chocolate chip cookie. For this year’s Cookie Party, I knew I wanted to bake two types of gluten-free cookies because I figured most of the cookies friends would bring would be glutenful and I knew three people attending are gluten-avoiders. I wanted their cookie options to be interesting, delicious, and safe. When Shauna James Ahern and Dan Ahern launched a kickstarter last November, I kicked in and was rewarded with a box of their gluten-free flour with a chocolate chip cookie recipe on the side of the box. I had a hunch that the ingredients were within reach and proceeded to mix them together. I discovered happily the suggestion to add chopped hazelnuts to the batter. Bingo! When these cookies hit the cooling rack, it was mighty hard to hold myself back from just eating one with chocolate melting as the cookie is torn in two. Aside from the cookie being a good gluten-free cookie, this was one good cookie. I spirited over to my cookbook shelf. 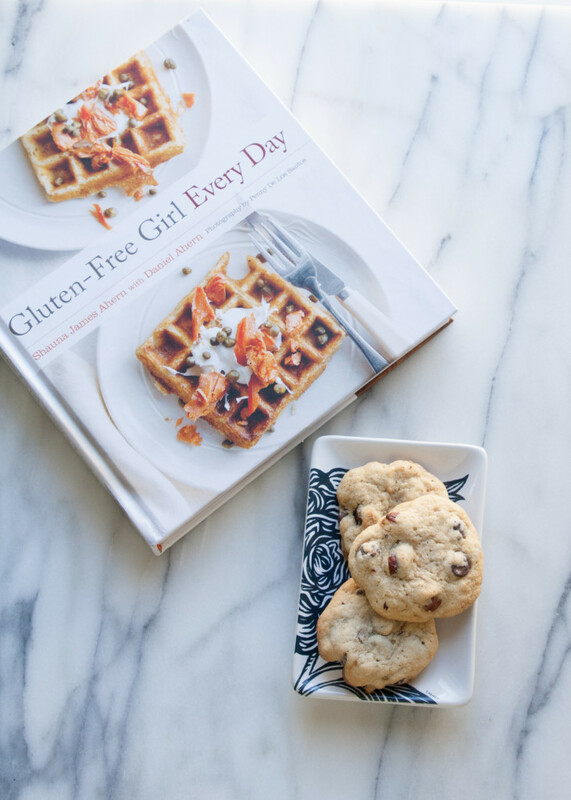 Sure enough, inside Ahern’s James Beard award-winning cookbook, Gluten-Free Girl Every Day, there on page 289, was the Chocolate Chip Cookies with Hazelnuts recipe. Ahern and I worked together at a previous company. Her writing wins me over and her recipes are easy to navigate. Earlier this year, we earmarked several of their recipes while going through a Whole 30 nutrition reset. I’ve bookmarked others like the Edamame and Sweet Rice Salad with Salty Seeds (p. 151) for a quick weeknight meal or the Millet Fritters with Feta, Spinach, and Golden Raisins (p. 98). I’ve made their Millet Waffles with Smoked Salmon, Creme Fraiche, and Capers (p.103) which were light, crunchy, briny, creamy, and smoky. This cookbook leans on the more savory side and so do I.
I believe in Christmas and the reason for the season. But, I also wish my friends Happy Hanukkah who celebrate that holiday and send Happy Holidays greetings to friends who exchange gifts without attachment. This is the first year I’ve caught a few sentiments thrown out declaring, “Happy Everything!” and I don’t know what that means. Let’s say that next year, the cookie party assembled under one theme, say chocolate chip cookies. I can guarantee that if there are 15 people in attendance, there will be 15 variations on the same chocolate chip cookie idea. And doesn’t that diversity make for a more interesting conversation? It’s hard to celebrate the season singing Christmas carols or being merry and bright in light of recent events including the massacre in San Bernardino. The Los Angeles Times style of reporting short bursts of updates has satisfied my need to know and stay current, perhaps to my detriment as I scroll and refresh the page with frequency, gobbling information like aforementioned cookies. We are at the start of two holidays that are celebrations and in the back of my mind I think about employees gathered at an ordinary office Christmas party in Southern California, not knowing as they drank cider or punch that their lives were about to change. Perhaps they too ate cookies before the doors splayed open. We gather together bringing who we are to the table. What we bring, who we are can vary differently from the person next to us, but isn’t that part of the beauty of a cookie swap? Your cookie will be different from my cookie and that makes it delicious in its own right. I can’t imagine requiring everyone to bring the same cookie made from the same recipe as the only way to party. Each cookie and each person who bakes them holds so much intrinsic worth. Sometimes, it is all we can do to come to a cookie party, toting a baker’s dozen to share with the stranger who looks nothing like us and who just might become a new friend. Sometimes, it is all we can do to spread cheer and be the change we wish to see in our world, in our living room, right here.